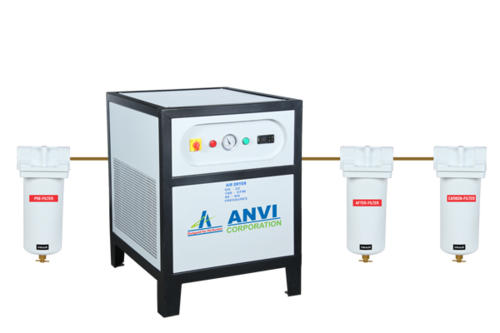 The basic theory of operation of the Refrigerated Air dryer is the deletion of moisture by cooling air to certain nearby temperature. There is no process known for producing cold, there is only heat removal. Heat is always attracted by the cold body. This is the basis for the function of a cooling unit. As long as the temperature of the cold body is lower than the hot source, there will be heat transfer. The air entering the system enters into the pre-cooler. A pre-cooler is a heat exchanger where the incoming hot air is being cooled by the outgoing cold air so as to reduce the heat loads for the evaporator and thereby the refrigeration system. The air from the pre-cooler enters into the evaporator. In evaporator the cooling, heat removal is done by the steaming refrigerant. The air with condensate enters into moisture separator, where the moisture is removed by the centrifugal action of air. The air free from moisture enters the Pre-cooler to cool the incoming air and thereby some heat is added. The refrigerant circuit consists of a Compressor, a Condenser, a Filter Dryer, an Expansion Valve or a Capillary Tube and an Evaporator.